The story of ‘Griselda’ was written by Perrault as a part of a series of moralistic fairy tales first published in 1697. It tells of a prince who punished his wife, not for fault but to test her virtue. He does everything to upset and antagonise; taking away her child, faking the child’s death, and lying that he wants to remarry. She is a paragon of obedience and refuses to complain until eventually her husband decides to trust her again. He retells the story of Griselda (previously told by Petrarch, La Fontaine, Chaucer and Boccaccio) as an example of ‘Heroic patience: not, I ought to say, for you to imitate in every way’. With this subtle qualifier to his moral, Perrault’s version rejects the dutiful feminine ideal frequently shown in other texts before him. The painting further explores this by suggesting that Griselda may have qualities even stronger and more complex than patience, however ‘heroic’. The questioning sadness in the portrait hints at an inner life behind her resigned compliance. 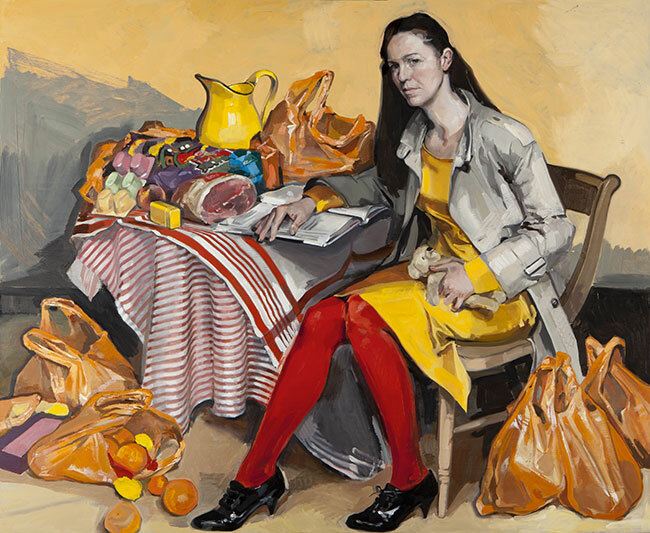 She is set in a contemporary household and surrounded by shopping bags and uncooked food reminding the viewer of her housework; also the knives and other weapons she has for possible revenge. The uneasy way she sits on the edge of her chair, holding her daughter’s toy, suggests movement and a question over what her next action will be and whether vengeance could be justified. In his sixties Charles Perrault, a successful civil servant under the reign of Louis XIV, abandoned his career to write fairy tales. The little we know of his personal life might explain this dramatic change. He married late to a girl much younger than himself. She was deemed unsuitable by his social circle, suggesting a love match. She died soon after having the last of their three children. Perrault never re-married and the testimonies of his contemporaries say he took a great interest in his children’s upbringing. Perhaps it was his increased involvement in their education and the combination of roles required of a single parent that brought him to story telling, commonly at that time a woman’s occupation. These fairy tales were given private readings in the fashionable literary salons of the French 17th century, which prompted intellectual discussion. This suggests Perrault wrote them not just for children but for adults too – and possibly to encourage debate at a time when a belief in male dominance by right was an assumption made by virtually everyone. The painting of Griselda in a current context evokes the same question today, in a world where sexual inequality is still unresolved. Based on Perrault's story 'Griselda' - see text below image. Смотрите описание site de rencontre у нас.